The Ohio state seal identifies government buildings and officials. The symbolism, history and emblems of the seal are described in this article with fast facts and information. Fact 4: Design based on a sketch by Secretary of State William Creighton, Jr. The full sheaf of wheat on cultivated fields symbolizes agriculture and bounty. The cluster of seventeen arrows, symbolizes Ohio's admittance as the seventeenth of the United States of America. In heraldry an arrow symbolizes readiness for battle. The Territory of the United States Northwest of the River Ohio (the Old Northwest) covered more than 260,000 square miles and consisted of the modern states of Ohio, Indiana, Illinois, Michigan, and Wisconsin, as well as northeastern Minnesota. The first recorded use of The seal of the Northwest Territory (the Old Northwest) was in a proclamation made on July 26, 1788. Congress passed legislation on May 8, 1792, that directed the U.S. Secretary of State to "provide proper seals for the several and respective public offices in the said Territories". 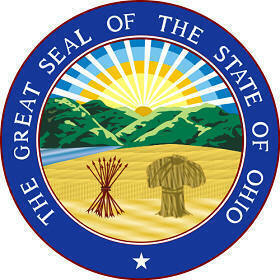 The Great Ohio seal was introduced when the state was admitted to the Union. 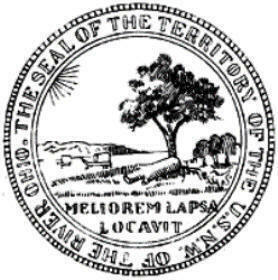 This is an early flyer depicting the 1876 design of the Ohio seal which is very similar to the modern version. The pictures surrounding the seal represent the importance of agriculture to the early economy of the state especially in relation to cattle ranching. The other picture depicts the cultivation of hops used primarily for brewing beer. Ohio brewed more beer than almost any of the other states. The image shows the the trellis on which the hops bines grew and flowered. Every spring the roots produced new bines that would be started up strings that were attached from the ground to an overhead trellis.